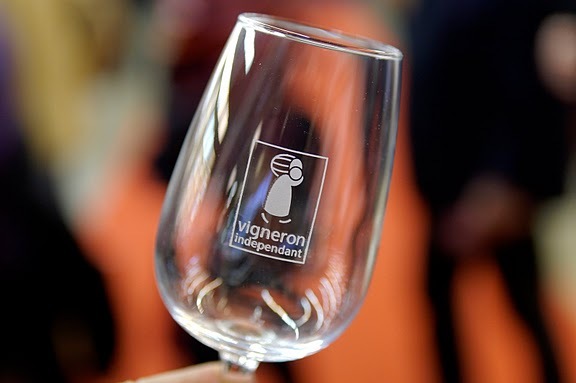 Rarely do you get such a glimpse of how basic an element wine is to French culture than at something like the Salon des Vins des Vignerons Indépendants. At an event like this one, you really get the feel of how wine is actually a basic food group for the French. It’s not a luxury or something that needs to be “mastered” but rather as elementary to daily life and basic needs as is water. As a tourist or even as a resident foreigner, this Wine Salon is something I plan trips around and mark on the calendar months in advance. 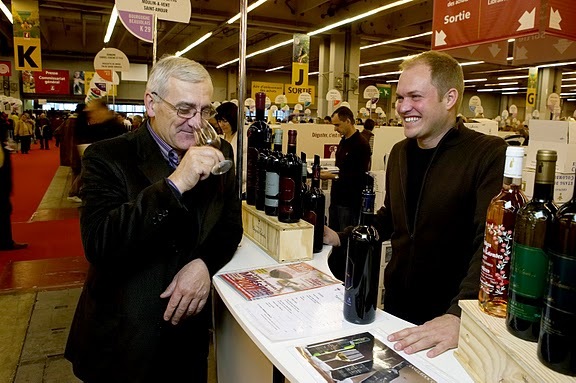 Held this past weekend at the ginormous Expo center that is Porte de Versailles in Paris, I had the chance to sip and taste new and just released vintages from over 250 independent wineries and winemakers from all the regions of France. The question was not a matter of access (entry cost 6 Euro) or accessibility (all the wineries were pouring). The question was whether I had the stamina to last a whole day. If I were a real pro, I would have gone over the course of each of the consecutive five days and prolonged the learning and the enjoyment, the listening and the tasting, stretching it out for every last drop. 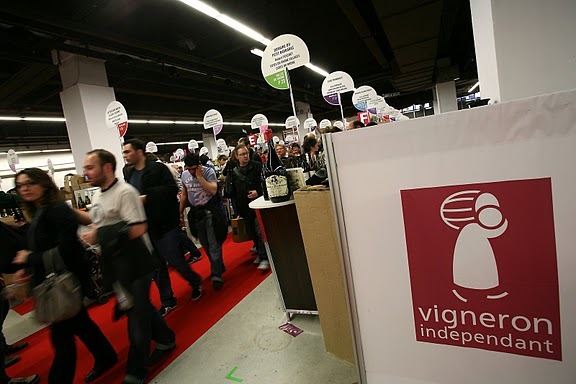 The Salon des Vins des Vignerons Independants is something that everyone even remotely interested in wine must attend at some time. 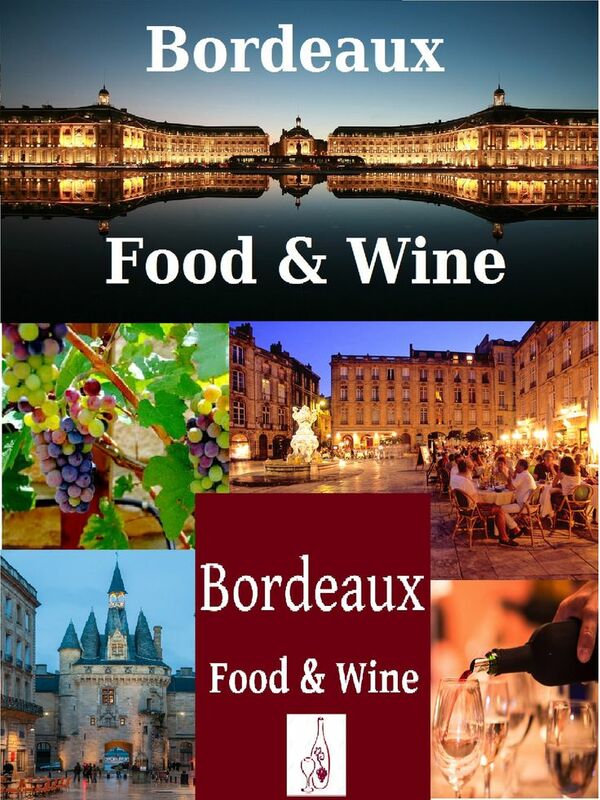 As a window onto wine and French culture, it’s unsurpassed. It’s also no-frills. And it’s held twice a year – in the Fall and in the Spring. 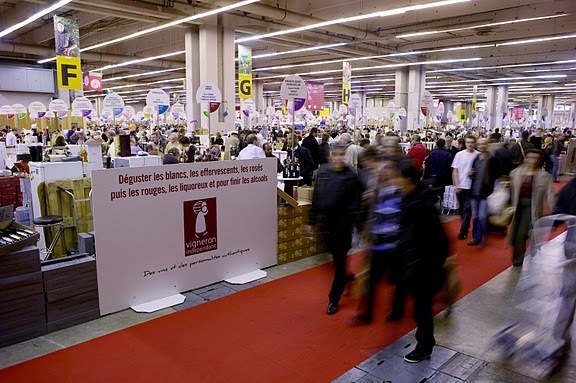 The only people I envied as I roamed the alphabetized aisles, were those who were savvy enough to have come with their rolling suitcases which they packed full of bottles and cases of France’s most excellent and affordable wines. Wine Tastings, France. Photo Copyright Laurent Hardhuin. They are located right in the heart of Champagne just between Reims and Epernay in Cumieres. They grow their chardonnay and pinot noir grapes on 10 hectares and produce 6 crus. Cuvée de Réserve Brut – dry, frothy bubbly. At 14.40 Euro per bottle at the Salon it stands up to any of the internationally known brands. Millésime 2002 – aged and made with pinot noir grapes as well as chardonnay, the richer, fruitier grape is detectable as soon as the elixir hits your tongue. At 22 Euro per bottle, you can see why I wish I’d had my rolling suitcase with me. The Salon tipplers tended toward the Alsatian wines, I noticed. Perhaps it had something to do with the fact that Paris had just seen its first snowfall of the season this weekend. It’s easy to think of a spicy Gewurztraminer and heavy spaetzle and sausages when it gets cold outside – all things that come from Alsace. Gewurztraminer Vielles Vignes 2009 at 9 Euro per bottle this tending toward almost sweet gewurz tasted of the grape. In the sense that I almost felt like I had popped a whole grape into my mouth and was drinking of it, and a splash of alcohol. Gewurztraminer “Cuvée Mégane” 2009 This guy was just shy of a late harvest wine. Its gold color spoke of its autumn, rich flavors even before it made itself known in the mouth. It sells for 13.50Euro per bottle. It’s just too novel when you come to the realization that these wines you’ve long loved come from an actual place. In this case, Chablis. Moreau Naudet at 5, rue des Fosses, Chablis offered Petit Chablis, Chablis 1er Cru and Chablis Grand Cru on offer. He ages his white wine for 24 mos. in barrel. Domaine du Mortier, Saint Joseph by Didier Crouzet. What’s a wine tasting if you don’t indulge in a bit of the sacred St. Joseph? Part of the geography of Côte Rôtie, a St. Joseph can take good care of you through the Winter. On 10.5 acres Mssr. Crouzet cultivates his vines of character. Domaine du Mortier, St. Joseph, 2008 A little light. Not often found in this wine or appellation, it can offer a more drinkable alternative to what is usually paired with a good steak or winter roast. Domaine du Mortier, St. Joseph, 2009 is a considerably more powerful wine. 2009 vintages, like the 2010 harvest, will have legs for years to come. Dark fruit, some wood, wine with a backbone. In this cluster were three domains that are run by the same winemakers and which are all independent. 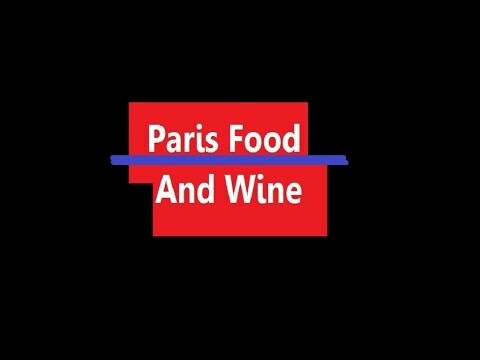 The majority they’ve brought to market this year have won a medal or an award or even a “coup de coeur” from the Guide Hachette des Vins 2011. Domaine de Fussiacus Pouilly-Vinzelles 2008. These grapes are from 30-40 year old vines. This lovely tinted yellow gold nectar won the Medaille d’Or Paris et Macon 2010. It was selling for a mere 10.30 Euro. Domaine Chateau de Chaintre Bourgogne Blanc 2008 is the one which you’ll find in the Guide Hachettes des Vins 2011 listed as the Coup de Coeur. It is burgundy chardonnay and its well-balanced, proper notes and aromas make it a perfect choice for a dinner with family and friends. Domaine de Fussiacus Vielles Vignes Pouilly-Fuisse 2008 had a nose of citrus and a delicious mouth of calcaire and mineral hints. Another one of those wines I wish I’d bought a case of. 15.10 Euro per bottle. From this region down near Perpignan which is still part of Languedoc-Roussillon you will find wines that have the garrigue in their molecules. A husband and wife winemaking team, Nicolas de Chevron Villette married his wife, Laure d’Andoque de Seriege, whose family has owned the Abbaye de Fontfroide and the vines that surround it for centuries. They have a tasting room, a restaurant and they offer vacation stays. It is also just 15 km. away from the region’s only 3 Michelin star restaurant run by France’s Best Chef 2010. Abbaye de Fontfroide Cuvée Deo Gratias 2007 A finessed red wine that speaks of the region and the terroir. The nose is aromatic, the mouth hints of the garrigue. Abbaye de Fontfroide Cuvée Oculus 2009 Though this is a white, it boasts a nutty mouth and an aromatic nose. At 7.10Euro a bottle, it is an elegant wine to serve at table with roasted poultry and new potatoes for example.